Here are where I will place my witterings on matters geekiness. Gainphile has been busy again with a revision (I believe 13th) of his open baffle speakers. The dedication to perfection is incredible! 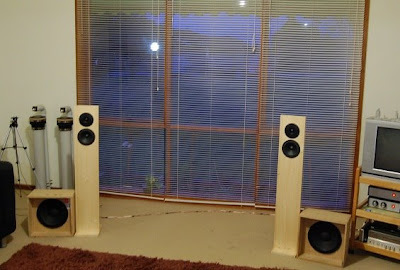 Over at his blog there are brief details and measurements, however follow the link from there to see the full story on diyaudio. Open baffle designs are not seen so much in commercial offerings but have some strong followers in the DIY builders community, basically they are speakers with no enclosure. I like this hack, mostly because the builder took a very pragmatic approach to achieving his goal. The RFID (Radio Frequency ID) reader used s designed to work on a serial port. Rather than build a circuit from the ground up to get this working on a USB port, a USB to serial adaptor was used instead. The end result is rough and ready, but think how much work and money was saved by using a cheap adaptor. Not only that but an un-needed MAX 213 was salvaged for the parts bin. OK these can be ordered on Maxims sample program, but parts bins always need that extra piece. You may have read already my review/build article on the TV-B-Gone Kit that I recently bought from Adafruit. Well I spotted in my e-mail this morning that Adafruit is having a clearout. They have a new TV-B-Gone kit in the pipeline and wish to clear through stocks of their existing kit. Their announcement doesn’t mention too much about the new kit other than that it will include codes for all regions. The one on sale is pre-loaded with North American and Asian remote control codes. However if you have the USB Attiny programmer, also available from Adafruit, you can reprogram the discounted TV-B-Gone kit with one of several firmwares available on the web. I love my TV-B-Gone, its a great toy and every inner child will love you for treating yourself to one. Just be careful, the temptation to switch off a football match in the bar is likely to land you in trouble! Josef Prusa has published a short article on a recent hack that he has done to a Netbook battery. He added a USB socket to the battery to allow him to charge devices such as i-phones independently of the PC. His Acer Wind in fact is surplus to requirements these days so this is an interesting way to recycle the old parts. Be warned however, you can’t just wire up the USB socket to the batteries, notebook batteries output 12v or more. Every so often you see something both ingenious and simple at the same time. This little device designed by Gerrit, aka "DammitCoetzee" is one of those things. Published on his blog is a how to on this nifty little tool, though you can probably see from the construction just how simple it is. I think I will be having a quick root around the cupboards to see if I have some round wood. Well done and thank you to Gerrit. A bit of fun, TV-B-Gone! I recently purchased a The Adafruit USBtinyISP AVR Programmer Kit from Adafruit. If you are unsure as to what this is, have a look at my article here. Although I want to use this programmer to try out some of the AVR based projects detailed on the internet, I figured that I needed to have a project to test the programmer with. I also thought that having a universal remote control might be useful in my job. Who am I kidding? I am 35 years old going on 10. When I read about the TV-B-Gone open source project I was giggling inside. Read more: A bit of fun, TV-B-Gone! Thunderhammer3000 (AKA Ben Scott) has posted a great idea over on Flickr. Frustrated at the low quality of standard proto-board Thunderhammer designed some for personal use and then had a large batch made up for projects. Ben is clearly an AVR enthusiast, and has geared the prototyping board with space in mind for one of these IC’s, but looking at it I was thinking that an audio proto-typer’s board would also be a useful tool. I was sent a copy of this deal from Maplin today, Looks to be a great price on the EeePC. Its the Windows XP version that they are selling. You may not be aware but Asus is moving the Eee range to the larger 10’ models. Personally I prefer the 9’ screen. I think that the 9’ model is about the correct compromise of keyboard size versus portability. With sub notebooks getting larger, I think now is a good time to get hold of one of these before the format is ruined.